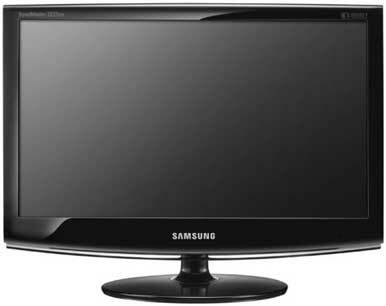 Measuring less than 22 inches, Samsung's SyncMaster 2233SW certainly won't replace your big-screen HDTV. But in our subjective tests, this 21.5-inch LCD monitor showed impressive image quality. Text on both black and white backgrounds looked crisp and easy to read, even at small font sizes. We also saw nuanced color, particularly in photographs, and our test portrait showed realistic skin tones and shading without any distracting contrast. The 2233SW fared well in our motion tests, too, showing little jarring or flutter. It performed admirably when displaying a video, exhibiting no noticeable jitter. When viewed from each side, the 2233SW displayed a consistent image; the screen did not fade or gray out when we looked at it from either the left or the right. You manage the on-screen controls via push buttons located on the right part of the bezel. Moving through the menus seemed a little confusing at first, but pressing random buttons eventually helped with the maneuvering. The 2233SW includes controls for adjusting color; the choices include cool, normal, warm, and custom. These controls will likely appeal to graphic designers and to other users who want to fine-tune an image, but with the 2233SW's color accuracy, such tweaks might not be all that necessary. The display has a shiny, piano-black finish. It tilts only with a very strong push—and that's all it offers in terms of adjustments. Ports are another shortcoming: It has just DVI and RGB-in ports, leaving off HDMI. The SyncMaster 2233SW is certainly a good deal, especially considering its solid image quality across the board in our tests, but it lacks extras. If you're shopping for a well-priced LCD monitor that delivers sharp text and bright colors and little else, this would be a good choice.